Carrot lover Jung Min was exposed by Hyun Joong that he had to gnaw carrot every night. Other than that, he loves carrot juice. This is why his nickname is 'Horse'. Follow by this a series of nicknames like Mal, Park Mal, Charisma, was originate from there. Jung Min's acting skill is one of the best among the members. It is not only because of his participation in a musical and received recognition but because when he made fun of Hyung Joon he will feign confusion which made people believed him. Jung Min is considered as the atmosphere creator in the team, always able to bring up the atmosphere of the event. Even when in Hong Kong he was unstoppable, no only throwing amorous glances, but kneel down while holding a fans' hand saying: "Do you want to marry me?" causing all the fans almost gone crazy. About fans support, all the while Jung Min is not stingy. Sweet talk become his best advantage in rewarding his fans. 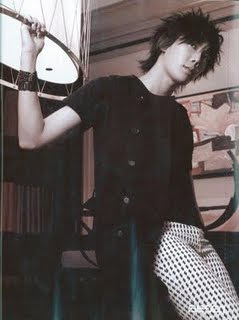 When in Hong Kong, Jung Min once used cantonese to praise his fans "Very Beautiful', making his fans to burst into joy. Jung Min who likes to nicknamed the rest of the members is actually a King of nicknames. He has all kinds of nicknames, example 'Park fragrance', 'Sister-in-law', 'Park Charisma', etc. A lot of fans jokingly said as long as there is one nickname you can think of, it will be suitable for him. Normally active and lively Jung Min when just woke up will turn into another person. He has very serious problem of being cranky when woke up. Whoever tried to wake him up will receive his 'fist and kicks'. Jung Min & Hyung Joon were like a pair of enemies. No matter what Hyung Joon does would be suppressed by him. Whether during bathing or waking up, both must bicker. Most of the time it would be Hyung Joon begging for mercy. Therefore, Jung Min is also crowned as 'Hyung Joon Killer'. Active Jung Min also takes the role of 'disciplinary Master' in the team. When others over do when having fun, he will come forward to stop them. However, most of the time it is to stop others from disturbing his rest. During their early promotion period in Japan, in one interview, leader Hyun Joong when being asked about Jung Min level of Japanese, Hyun Joong actually answered: "Around Japan Kindergarten level..."